I really wish I could clear my head when approaching Castlevania games, but I do have a bit of history with the series. Thankfully, I was able to put aside my initial issues with Lords of Shadow and enjoy a great new take on a Castlevania adventure. However, now MercurySteam is taking on the 2D Castlevania games and I had no idea what that would mean for the series. Admittedly, as great as they are, the 2D Castlevania games of the GBA and DS burnt me out on the series. Yet they are a dependable and one of favorite types of video gaming which means I and other fans could be resistant to a change in formula. Here’s the thing you need to know about MercurySteam, Lords of Shadow, and what I can tell about Castlevania: Lords of Shadow – Mirror of Fate from its demo – the Lords of Shadow series continues to be its own flavor of Castlevania, love it or leave it. 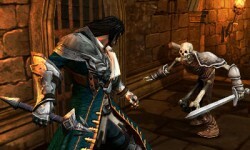 Fans and newcomers that are looking for a gothic adventure will be quite happy with the aesthetics of Mirror of Fate. Not only that, but unlike its big brother that sprawled out to various locations and took a while to find anything resembling Dracula’s titular homestead, this demo drops you right into a castle as Trevor Belmont. It’s the little things that make you feel at home while taking down evil. The feeling of the combat is ultimately what separates Lords of Shadow from other Castlevania experiences. From the moment the first skeleton did not go down from one single crack of my whip, I knew Mirror of Fate was not trying to be the same old Castlevania game. Combat in Mirror of Fate is much more deliberate, that is to say, I died a handful of times because I wasn’t paying attention or trying to play defense. Dodging and blocking are much more important even with fodder enemies as you’ll need to look for your opening and time your combos in order to be escape unscathed. You don’t want to get caught in an elaborate animation sequence because your enemies will not be impressed, at least until you expertly put them away with a satisfying finishing move. I don’t think you understand how easy skeleton warriors are supposed to go down. When the action calmed down, it was time to search through the castle. Being a polygonal adventure rather than a pixel driven one, it takes a bit of time to adjust to Trevor’s jumping style, but I had no real issue with the platforming after a few trials. The combat cross is back as well as its multiple functions as a whip and a grappling device for climbing and swinging. While it remains to be seen just how linear this castle will be, the castle itself contained slightly varied environments, and the map teased a much larger experience with plenty of ability upgrades. The demo has a nice balance between exploration and combat sequences so my hope for plenty of shadowy corners containing upgrades that open more shadowy corners remains intact so far. I’ve been nervous about how the Lords of Shadow would translate into a 2D game. It didn’t exactly match my expectations of pulling from the well-established 2D Castlevania blueprint, but Mirror of Fate doesn’t seem to break anything either which may become the hallmark of the Lords of Shadow franchise by the time all three games in the series are finished. The Mirror of Fate demo is pretty short and only features one playable character. 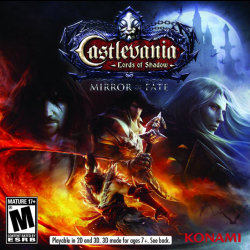 Anyone expecting just another Castlevania game would do right to give the demo a try first, but fans of Lords of Shadow and 3DS owners looking for a no-nonsense gothic adventure game should both be excited the release of Castlevania: Lords of Shadow – Mirror of Fate on 3DS on March 5, 2013. Castlevania: Lords of Shadow Recoil Review: Did I Read the Name Right?